I was searching for a flat-panel LCD monitor for my Commodore 64, and read the Dell 2001FP is very popular. Just make sure you get one manufactured June 2005 or earlier because Dell changed their panel supplier in July 2005, and people have reported the older panels work better with the C64. 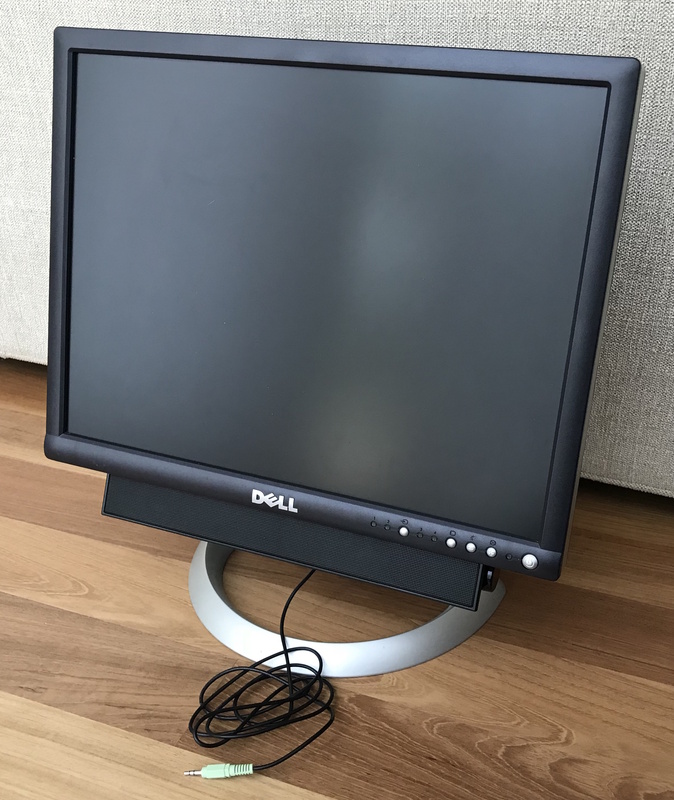 Dell 2001FP (Craigslist) with AX510PA soundbar (eBay). In addition to being one of the best monitors in its day, it’s equipped with three analog ports: S-Video, Composite, and VGA 15-pin D-sub. Its single digital input port is DVI (DVI-D). I’m using an 8-pin DIN to s-video cable to connect the C64 to the 2001FP. The cable also breaks-out C64 mono audio to left & right “RCA-style” audio connectors. The 4:3 aspect ratio that matches these old computers is getting harder to find. And it gets better: To my surprise, the 2001FP also has a 12V power OUTPUT port that is used to power an optional AX510PA soundbar (many for sale on eBay). This provides a clean, integrated audio system for the C64. You just need a cable (or adapter) that converts your C64’s audio to a 3.5mm stereo port (mono to stereo as necessary depending on your C64 cable). The “PA” in AX510PA stands for Power Adapter. 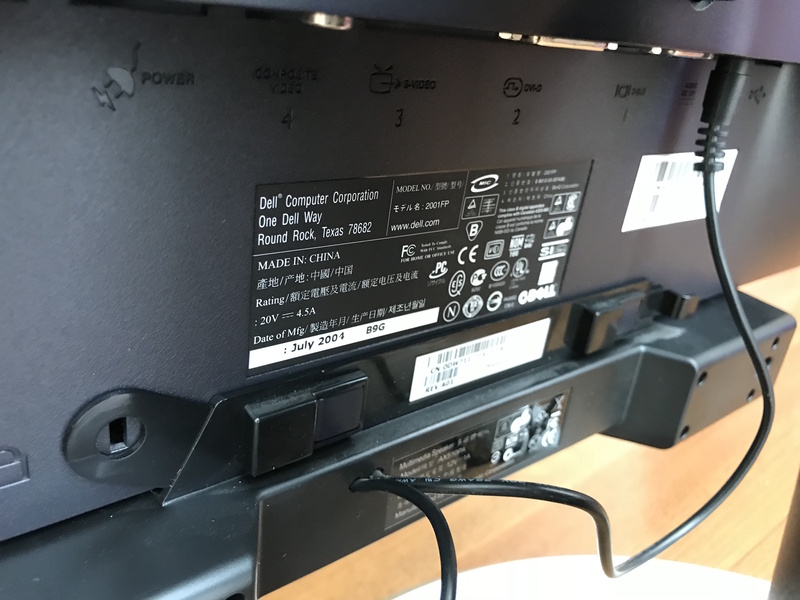 The power adapter is a AC to DC wall wart that powers the soundbar, because some Dell monitors did not have an onboard 12V DC that the 2001FP has. So for the 2001FP the power adapter is not necessary; the onboard 12V means less cabling & a neater appearance! Soundbar is powered by the 2001FP. Love it. One thing surprised me when I was testing the soundbar: The soundbar emits audio only when the monitor detects a video signal, which in retrospect makes sense and saves electricity. 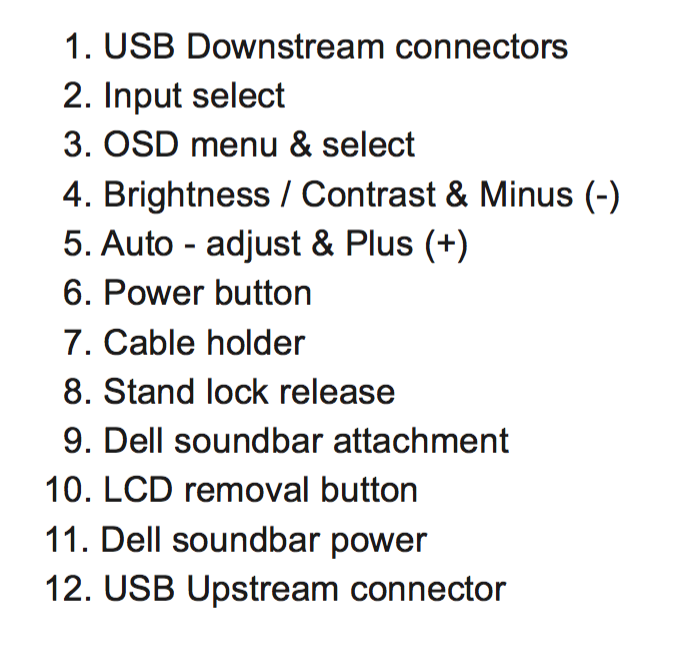 No reason to power the soundbar when nothing is displayed on the monitor. It’s just that when I was testing the soundbar, I had the monitor powered on (but no computer attached) and naively expected the soundbar to emit audio from my attached iPhone. Hint: the soundbar has white led in the center (hidden behind the grill) to indicate when it is on. Verdict: Excellent monitor for retro computing thanks to its s-video and composite inputs. Optional soundbar looks great with clean integration of power fed by the host 2001FP. Footnote: There’s a round dial on the soundbar’s right side for volume control (see first photo). When the volume dial is at the minimum setting, the dial clicks pleasantly to power-off the soundbar, nice! Footnote2: The soundbar simply slides into 2 small slots on the bottom portion of the 2001FP. There is a satisfying click after it is fully slid into place. No tools are necessary. Footnote3: The stand is very good. Not all monitor stands raise & lower the screen vertically. That is, some rely on tilt for adjusting vertical view. This stand has pan, tilt, and telescopic raise/lower. It also has rotation (if you want the screen in portrait-mode instead of the common landscape-mode). See diagram item #8 below, which unlocks the vertical height adjustment. Footnote4: There are four USB-A “downstream” ports (2 rear, 2 side). This is basically a USB hub for your peripherals. One USB-B “upstream” port in the rear is where you connect your PC. Footnote5: The power-in port is a rather unexpected 4-pin, round. Try to find a 2001FP with the power adapter, else you’ll have to buy one off eBay. Footnote6: C64 video looks WAY better (crisper, less blurry) via the s-video port than the composite port. This was expected, but I was surprised how unbearable composite seemed when compared to s-video; thought they would be closer in quality. Make sure the chroma pin on the 8-pin DIN connector has a 300-ohm (or 330-ohm) resistor, else the color signal will be too strong (results in bad color bleed/distortion). Adding ~300-ohms to the C64’s chroma output results in a video signal closer to the s-video standard, hence better quality. Footnote7: Very early C64’s had a 5-pin DIN port, instead of the more common 8-pin DIN port. Legend for Dell 2001FP port diagram. 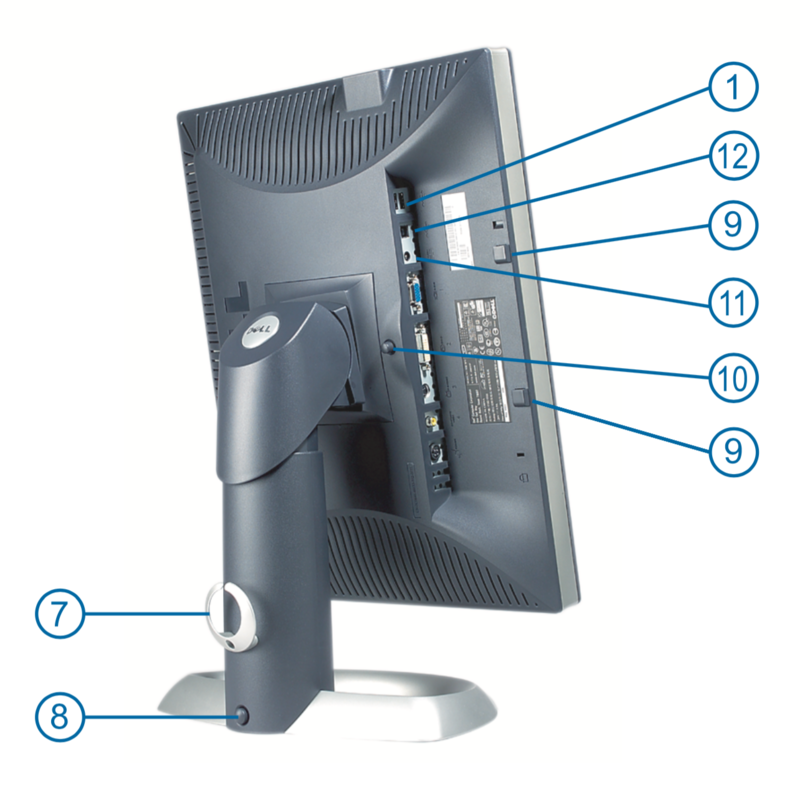 2001FP rear ports: 2x USB-A downstream to peripherals, USB-B upstream to PC, soundbar power-out, VGA, DVI, S-video, composite, monitor power-in. There are two more USB-A downstream ports on the side of the monitor.